There’s always something to see in Los Angeles. 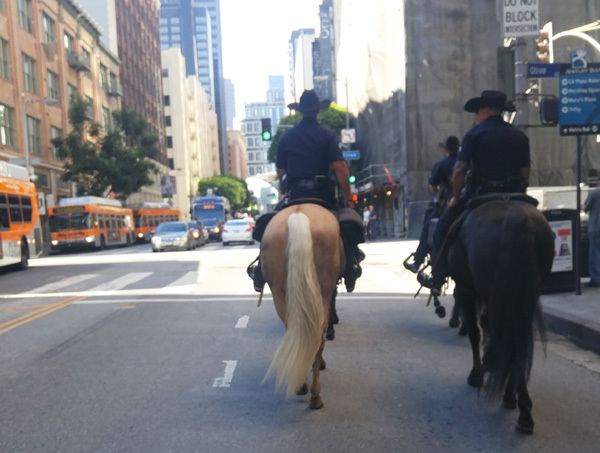 About every three months, I seem to come across the LAPD Mounted Unit through the non-rural streets of downtown. I don’t know if they’re in town for show, doing serious forensic work or just a really bad at posse. For whatever they do, I’m fine with. The point I’m going to bring up relates to a video I shot earlier this week. This isn’t about the four horsemen of the metropolis taking up the bike lane I was heading down. Is there a crazier environment to bring horses than downtown? You’ve got cars zooming by, buses howling at you and loud sounds from businesses trying to get your attention. And yes, a cyclist going right by. Now if anyone if going to give me guff about scaring their horse, it’s going to be some authority figure. What the video doesn’t pick up is the nice hand wave gesture we shared, which meant they were pretty cool with where I was. Riding by horses is not a problem, yet these Burbank riders think it’s enough of a threat for a person walking a bike by them that they had them banned from the Mariposa bridge. In other words, if these cops can travel through the most hostile environment, yet these Burbank horsemen can’t handle inanimate objects, they really shouldn’t be riding at all. Or making safety decisions either.